Close to the beautiful central station you can find Bier Central, a pub in which you can choose from a catalogue of beers. 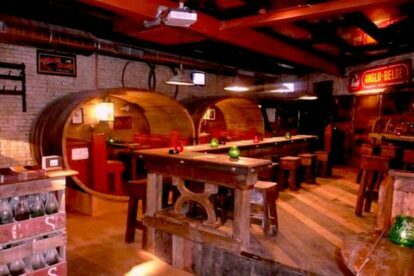 They have a terrace outside and a very cosy interior with barrels and booths that give it a rustic and authentic flair. The food is tasty as well and the waiters are fast and friendly, no matter how busy it gets. I had some of my best nights there with friends and was always able to have nice conversations with other customers who are mainly international and from all age groups. It’s very central and easy to reach and you will always be able to get to some place else afterwards.